To achieve a good signal-to-noise ratio, it is important to block non-specific antibody binding sites either on the transfer membrane or the ELISA plate. Protein based blocking solutions like skim milk, BSA or casein solutions may not only block unspecific binding sites, but mask as well specific binding sites. With BlueBlock PF (protein free), the specific binding sites remain accessible while non-specific reactions are suppressed, thus leading to an increase in signal intensity. 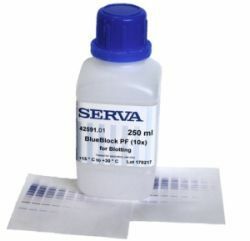 The "Product of the Month" promotion is for all SERVA customers within the EU and cannot be combined with other discounts, promotions etc..
General questions about Western blotting? Problems with protein transfer or chemiluminescence detection?